Die-hard eclipse chasers have journeyed to the Southern Hemisphere to catch a short and dramatically thin "ring" eclipse of the Sun. Whenever the Moon passes directly in front of the Sun, termed a central solar eclipse, we Earthlings usually conjure up visions of the awe and spectacle of totality. But that's not always the case. The orbital geometry of the Earth-Moon system is subtle. At this time of year, Earth is relatively close to the Sun in its not-quite-circular obit, so the solar disk appears larger than average. And this coming weekend's new Moon is about midway between its perigee on February 18th and its apogee on March 3rd — so its disk won't be particularly large. The upshot is that when the Moon and Sun meet in the sky on Sunday, February 26th, the result will be an annular or ring eclipse of the Sun. Astronomers calculate that the magnitude of this eclipse — the ratio of the Moon's apparent diameter to the Sun's — is 0.9922. So this event will be very nearly total and only barely annular. It'll be a dramatic sight along the centerline, as the ring at mid-eclipse will be no more than about 15 arcseconds wide! This geometry also means that the path of annularity — called the antumbra — is very narrow, 31 km (19 miles) wide at the point of greatest eclipse though flaring to as much as 96 km (60 miles) at the endpoints. The culminating ring in this 3¼-hour-long event will last for at most 44 seconds. Many eclipse-chasers are traveling to southern Argentina, where the prospects for clear skies on eclipse day are most favorable. 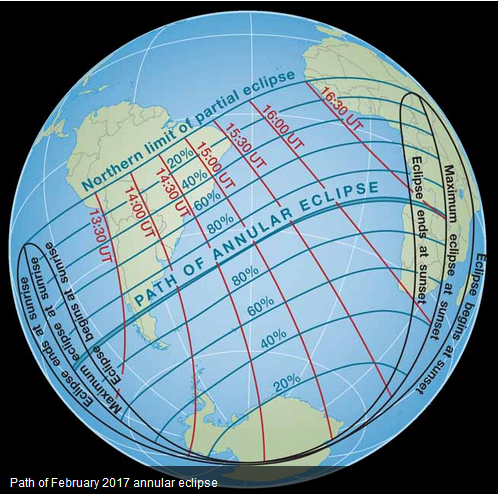 The eclipse will be confined almost entirely to the Southern Hemisphere. 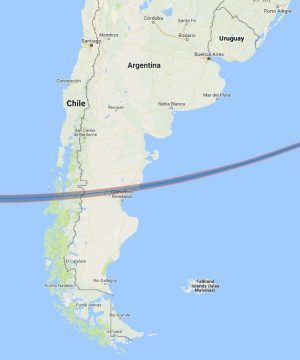 The path of annularity crosses parts of southern Chile and Argentina, the South Atlantic Ocean (where mid-eclipse occurs at 14:53 Universal Time), Angola, and (at sunset) the Zambia-Congo border. Partial phases sweep over most of South America, Africa, and Antarctica, as the globe above shows. North Americans are left out entirely. According to meteorologist Jay Anderson, the weather prospects in Africa are relatively poor. But they're much better in South America and especially over the flat Patagonian plains of southern Argentina, where the likelihood of a cloud-free morning is 60% or better. Not surprisingly, that's where most eclipse-chasers are headed. So wish them all clear skies — and let's hope they take plenty of dramatic images of this celestial treat.